Le Chene Voted Most Romantic Restaurant in LA! 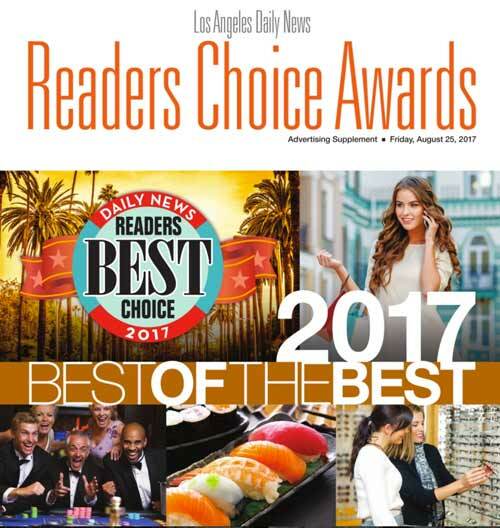 In their most recent Readers Choice Awards poll, published on August 25, 2017, readers of the Los Angeles Daily News have once again voted Le Chene “Most Romantic” Restaurant in all of Los Angeles! The poll received over 35,000 votes and we’re extremely grateful to all of the wonderful customers and patrons who voted for us. We have always strived to make Le Chene a romantic destination restaurant for couples from everywhere, as well as a unique and intimate setting for banquets and events from weddings, birthdays and beyond. Considering the vast number of restaurants all over Southern California, we are extremely proud of being recognized in this prestigious publication and we sincerely appreciate everyone’s support! Considering the vast number of restaurants all over Southern California, we are extremely proud of being recognized in this prestigious publication and we sincerely appreciate everyone’s support! If you would like to read about the award in the online version of the LA Daily News Readers Choice Awards edition, you can view it here. From all of us at Le Chene, thank you!! Driving into Le Chene is like to visit a church of class. Near Valencia, the restaurant also features local wines made by its fearless leader, Juan. They still use white tablecloths, unlike most of the chain restaurants. The wine list still carries an in-depth and very impressive selection. We tasted wine and while thinking about each taste, a regular customer came to the bar, who is a friend of Juan. He offered us a sip of champagne. We had a bite to eat and I started to think about the day. Juan’s cuisine is vitalized classic European and his tongue is legendary, both for food and wine. He liked a Pinot Noir from the four best and even though it was not my number one, with his tongue it was magic. His friend smiled and showed me a bottle 1970 Chateau Mouton Rothschild. He even had a price tag from the time when he got it – $42.70. The wine showed no watery rim and had a brown tone and edges. We finished the bottle with him and while we were there, a nice lady in the bar also tasted two of the Pinot Noirs, blind, so we could help her to learn about them. We even enjoyed a rare Italian Varietal bottle from Juan and while driving home, we had a rare feeling. The day’s memories are what keeps us dreaming better. Thank you to all for making life the best! Recently my husband and I vacationed in LA and took the Vintners Assemblage Tour which included two wineries – Antelope and Reyes — and the Le Chene restaurant. The ride was smooth, but how can it not be in a really nicely equipped Suburban? Our guide, Juillet Wellons, was every bit the consummate hostess — knowledgeable, smart, friendly, warm and very professional. Our tour started at Antelope Winery – small and quaint, reminiscent of a country store, but that quickly changed. Our wine steward, Joyce, was a sweetheart. She knew her wines, yet never pushed anything too hard, taking the time to listen and steer towards good choices. She explained the winery’s history and the wine types so well, it was truly a comfortable welcoming experience. Reyes Winery is nestled in a valley area surrounded by mountains, with restored Spanish style buildings. The setting is beautiful, but it’s the tour that makes it extraordinary. Avid artist, developer turned vintner, a real renaissance man — Robert Reyes is riveting in his talk about the ins and outs of winemaking on his sixteen acres. To see the operation, hear about his history and view and taste the results makes for a very special event. Our tour ended with dinner at Le Chene and while it culminated in an unbelievably delicious meal it was the service that took it over the top. Juan Alonso, owner, commented that they were so far from anywhere that everything had to be good to keep his customers coming back. By the end of the evening we knew that to be a serious understatement. The food– OMG! Hands down, our meal easily beat any five star restaurant! So satisfying, we had four orders of Escargot! Our waiter recommended the elk and while I have never had it before, it was meltingly fantastic (yes, this meat melted!) and I will go back for more. Juan Alonso is suave, charming and gracious, we loved hearing about and sampling his wines. He knows what excellent service really means and his staff, even down to the bus person, gives such great attention that it was much more than a meal. This was the perfect ending to a magical day. The Vintner’s Assemblage won’t disappoint! We were just on its first soft opening and it far surpassed anything we could have expected. I can imagine that as it evolves with these wonderful people it will only get better. Thank you SCVT for a tour of a lifetime! To Juan, his management team, and the wonderful staff who made my parent’s Anniversary Party a success – thank you, thank you. Being a restaurant professional for over 30 years, I am qualified to say that everyone was exceedingly professional yet personal, kind and attentive. The lead server Sherry (please forgive me if I misspelled her name) was more than we could have asked for, and played a key role in the evening’s success. I also wish to mention your kitchen. Many times with large parties there’s an assembly-line quality that unfortunately reflects in the plates going out. Not so with your restaurant. Every plate looked like it was ordered off the menu, and that impressed not only myself, but our guests as well. I thank you. If anyone from Le Chene is in Sherman Oaks, please feel free to see me at The Local Peasant. It would be my pleasure to extend every professional courtesy to anyone who contributed to this event that was so very important to my family and me. We have been coming to your restaurant since 1983 – It has always been our “special” restaurant. Love Alberto! He is Great!